I don’t really remember teacher appreciation week being a thing when I was in school in the States. I have a few memories of giving teacher-y trinkets—apple-shaped refrigerator magnets, coffee cups printed with “#1 Teacher!” in faux chalk—but I don’t ever really remember a time during which my teachers were formally recognized and celebrated. In AmSam, teacher appreciation week is like a national holiday. Last year, when I taught elementary, I received small gifts every day of the school week (mostly candy and leis) and a great big heap of presents on Friday (including hand-embroidered pillow cases, a hand-woven basket, and jewelry). This year, the Dept of Education, under the new director, decided to hold a huge celebration for all DoE employees on the main island of Tutuila. Each school district was asked to prepare a song or dance (or both) to perform at Veteran’s Stadium (Am Sam’s high-school football field and event-holding hotspot). Now, anything that has anything to do with Samoan tradition is done right in Manu’a. While other schools performed a few songs or dances (including an all-fa’afafine Harlem Shake), the Manu’a Tele district put together a good hour-long performance (12 songs and a few dances). We practiced for an hour or three nearly every day leading up to the big hoorah, including Saturdays. At times it was extremely frustrating—cutting instruction time for practice, changing the songs and dance moves daily, etc—but all the while I tried to remember that this was exactly that kind of thing that I wanted to experience when I left GA for Samoa in the first place. The problem for the Manu’a Tele district, in addition to the many many many hours of pese (song) practice we were having, is that we would have to take a boat to Tutuila for the celebration, which meant canceling school two weeks before final exams. We had class on Monday and Tuesday but the rest of the week was canceled. We met at the elementary school in Faleasao to practice one last time before getting on the boat, and to let all the villagers who couldn’t leave for Tutuila see our performance. The boat ride there was really fun. We sat on the top deck of the boat with some of the WorldTeachers, talking and laughing the entire ride. A lot of the teachers stayed together at Airport Inn, but Wes & I decided to stay in Leone with our friend Amber. The next day we had our final final practice at the Stadium. Zumba! We’re color-coded by district. On Friday, the big day, all of the schools donned our color-coded-by-district field day outfits (Manu’a Tele is purple) and had a “parade” (we walked around the track) to introduce each school to the audience. Once all the schools were on the field, we did about 20 minutes of zumba (for real) and then we were served breakfast. The Director of the DoE gave a short address, Gov. Moliga spoke, and then we did several field day activities. Wes participated in a quite a few of them. Manu’a won nearly every event! We felt like VIPs all day. Since the Governor is a graduate of Manu’a High, and because school pride is a very serious thing here, our district was seated in the center, nearest to the Gov and the other honored guests. It was pretty cool. Manu’a performed first and we were awesome. I was so incredibly proud to be a part it, and I know that our (meaning the palagi, of course) participation really made a difference to the audience. We knew our songs (even if we didn’t know what we were singing), we knew our dances, and we performed just as well as our Samoan co-workers (thanks to those many hours of practice). It was such an honor to have been included. And to have the experience of performing a traditional Samoan pese with our friends, neighbors, and co-workers, and to do a siva samoa in front of a thousand+ people, was incredibly. I am so thankful to have been a part of it. The performance and the audience’s reaction to it made all the long practices and frustrations so very worth it. But then… oh man. The boat ride back. We left at night. The boat was super crowded. We sat in the same seats upstairs on the deck, only this time it was raining. I ended up sitting backward in my seat because the aisle was too crowded and wet to put my feet forward anyway; so there I was, cross-legged in this tiny little chair, sharing a pillow with the woman sitting behind me. Did I mention that it was raining? And that the water from the small roof over our heads poured down every time we hit a wave, which was like every 10 seconds, so I was soaking wet. And, of course, I was also super sea-sick. For eight hours or so. It was not a good time and I did not feel appreciated even a little bit on the ride back. There have been so many moments this year during which I have sort of woken up and realized where I am and what’s happening—it’s like some part of me steps back and takes it all in and I am amazed. That happened a few times during pese practice and oh-so-many times during our actual performance. I mean, years ago, if you would’ve shown me a photo or a video of snippets of my life, I would be amazed. I would look longingly at those images and say “I want to do that! How can I do that? !” It helps to remind myself of this when I’m frustrated or home-sick. And honestly, even that horrible return trip to Manu’a, that most awful boat ride, that was still one of those times. I mean, yes I vomited into a plastic bag and then had to try to sleep while holding it closed because the waves were too rough, the boat too crowded, and my stomach too angry to maneuver myself to a trashcan. Yes, I was miserable, but Jessie (a Fiti’uta WorldTeacher) and I still laughed about how miserable it was the whole ride back. When it was all said and done, teacher appreciation week was awesome. Working with teachers from the other schools in our district strengthened our relationships with those schools and their staff. We worked hard together and did something we were all proud of, and in the end I felt more special and appreciated than I ever have. What’s left of the 2011-12 WorldTeach group: The Beard, Heidi, Drew (our Field Director, a 2010-11 volunteer), Amber, and me! 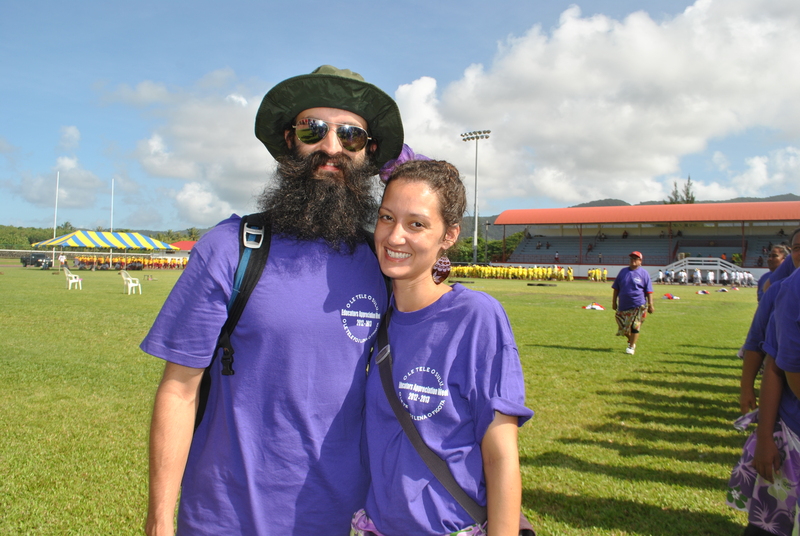 This entry was posted in American Samoa and tagged american samoa, manu'a, Teacher Appreciation. Bookmark the permalink. Awesome recap! Thanks for all the work you and the beard did in AS.